Quarta-Feira Fotos. Fissura da Granja II. Bruno Cochofel na Fissura da Granja, Serra da Freita. Foto Sérgio Martins. This entry was posted on Quarta-feira, 26 de Março, 2014 at 11:59 am and is filed under Foto. You can follow any responses to this entry through the RSS 2.0 feed. You can leave a response, or trackback from your own site. One Response to Quarta-Feira Fotos. Fissura da Granja II. 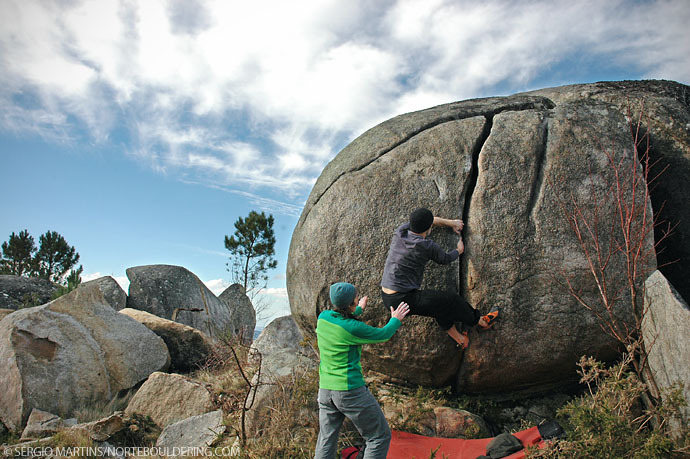 I’ll be in Portugal for a week and I am looking for information about bouldering in northern Portugal. Are there topo’s of the areas Corno de Bico or Santo Tirso? Is there somebody who wants to help me?